Lance Davids had a meteoric rise in his career when at the age of 15 he was singed by by 1860 Munich. He eventually played 21 games for them before moving to Djurgaden in Sweden. 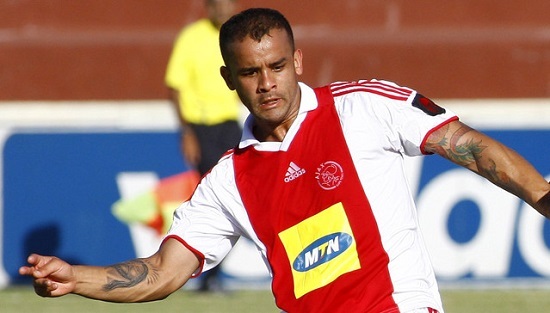 After returning to South Africa for a few years with Supersport United and Ajax Cape Town, he was selected as part of the FIFA 2010 World Cup Squad. After a brief stint in Belgium he is back in Cape Town and is targeting silverware. We caught up with Lance and had a chat about all things football. ATJ: Firstly thank you for taking the time to do this interview with us! You moved to 1860 Munchen at 15, how big a challenge was it making a move to a new country so young? LD: It was a big challenge leaving my family, in fact leaving everything behind and moving to a new country, a new lifestyle, etc, at a young age. It was so difficult in the first year but it was my dream to play abroad and I had to sacrifice lots of things but at the end I benefited and experienced a lot from it..
ATJ: Having played in Germany, Sweden, Belgium and South Africa, what is the biggest difference for you between the leagues? LD: In Europe the game is more direct, and you get punished for any mistake you make on the field. In Europe my opinion is that the players are more disciplined. ATJ: What was the experience like for you being part of the 2010 World Cup squad? LD: Being part of the squad was the highlight of my career, every football players dream is to be part of the World Cup squad. What made it even more special was the fact the tournament was hosted in South Africa. It was a pity we did not make through the group staged but overall I think we competed well. ATJ: You came from Hellenic, how much did it help coming through a strong youth system like that? LD: Hellenic played important role in my developing had fantastic coaches and it’s through them that I am who I am today. ATJ: What has changed in the PSL between your stints in the league? LD: My opinion is that the league is much more competitive and every year the level of football improves. ATJ: How do you feel about this season and how the team has done? LD: The season started slow for us but we picked up momentum towards the end. We were lying 5th at the close of the Xmas break. Then we changed coaches and it’s not easy just to adapt to a new philosophy. Then Rodger came in and we had good games, of course he could not change much but I’m sure he will make us winning team and challenge for honours next season. But overall as an Ajax player you always want to be in the top 8 or compete for the league so it was not the ideal season for us. ATJ: What are your aims for next season? LD: To have a good pre-season and play as much games as possible and to avoid small niggling injuries. And off course try and win silverware. ATJ: What are your ambitions moving forward? LD: My ambition is to play as long as I can. I am studying sports management at the moment so after the football career I would love to stay in football industry, my dream or goal is to be a sports director. ATJ: Who has been the most difficult player you’ve faced? LD: Deco from Portugal, played against him in an International friendly. ATJ: Who has been the most talented player you’ve played with? ATJ: Which is your favourite stadium you’ve played in? LD: Allianz Arena in Munich Germany. LD: Being part of the 2010 World Cup Squad. ATJ: As All Things Jabu is a sports blog, what other sports do you enjoy watching and who do you support? LD: I love watching Cricket playing Poker and playing with my Daughter. ATJ: Where can fans keep up to date with your news?